Figure 1. 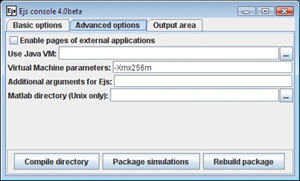 The Ejs program window showing the package simulation button and tooltip. Ejs allows users to create and run models within the Ejs authoring tool. An additional feature in Ejs is its ability to package Ejs models, their resources and code, and all additional html documentation into a single executable jar file. Figure 2. The Ejs console showing the three buttons used for creating stand-alone Ejs packages. Packaging single models: Once a model has been run (compiled) within Ejs, the Package current simulation button can be clicked to package the current model and its resources. Right-clicking this button gives additional options. Packaging multiple models: Right-clicking the the Package current simulation button and selecting the option, Package several simulations, allows the option of packaging multiple models. These models have to be compiled first, before they are available for packaging. From the Ejs console's Advanced options tab, authors can compile multiple models within a particular directory and then these models (or a sub set of these models) can be packaged within a single archive using the Package simulations button. 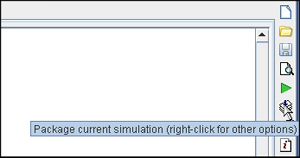 Exporting source files: Once a model has been run (compiled) within Ejs, right-clicking the Package current simulation button allows the option of zipping up the current model and its resources via the ZIP the simulation source files option.